On August 2-10, the 40th COSPAR Scientific Assembly was held at the Lomonosov Moscow State University, Russia. The Assembly, jointly organized by the Lomonosov Moscow State University and the Russian Academy of Sciences, attracted more than 2200 scientists from all over the world. 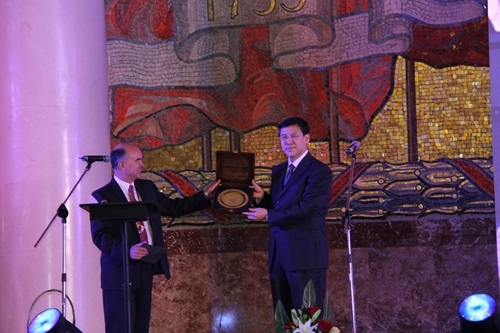 Prof. YIN Hejun, Vice President of the Chinese Academy of Sciences (CAS) and President of Chinese National Committee for COSPAR (CN-COSPAR), attended the opening ceremony and presented the 2014 CAS/COSPAR Jeoujang Jaw Award to Prof. Martin Sweeting. Prof. WU Ji, as the Vice President of COSPAR, bestowed the 2014 COSPAR International Cooperation Medal to Prof. Carlé McGetchin Pieters from Brown University after reading the citation. He also presided the COSPAR Bureau Meeting and the second session of COSPAR Council meeting. More than 126 Chinese participants attended the Assembly. And presentations covering a batch of extensive space research directions, such as space physics, space environment, space exploration, etc, were given during one-week Assembly. The Committee on Space Research (COSPAR) was established by the international Council for Science (ICSU) in 1958 as an interdisciplinary scientific body concerned with the progress on an international scale of all kinds of scientific investigations carried out with space vehicles, rockets and balloons. The National Space Science Center, CAS, now hosts the Chinese National Committee for COSPAR.